Horses at the Maple Sugar Festival in 2007. 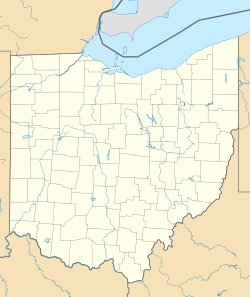 Malabar Farm State Park is a state park in Richland County, Ohio, United States, located near Lucas and the Mohican State Park. Nestled in the hills of Pleasant Valley, Malabar Farm was built in 1939 by Pulitzer Prize-winning author Louis Bromfield and was his home until his death in 1956. On May 21, 1945, Bromfield hosted Humphrey Bogart and Lauren Bacall's wedding and honeymoon at Malabar Farm. Bromfield grew up in Pleasant Valley. When he returned there as an adult, he wanted to buy an old farm—the Herring farm. Eventually, he bought the farm from Clement Herring in 1939. He also bought adjacent farms in 1940 and 1941. In all, he owned 595 acres of land. The Bromfield family moved to Pleasant Valley in 1939 and lived in the “Fleming house” until their “Big House” was built. Bromfield chose architect Louis Lamoreux of Mansfield to help him design and construct a Greek revival style home. The original Herring house was used as the center of the construction. The Big House was expanded from this focus point and made to look like sections had been added on over the years. Bromfield was constantly ordering changes to rooms and walls. Thus, the project was dragged out for 18 months. The 32-room western reserve, where Bromfield wrote many of his books, attracted film stars, artists, politicians, writers, and conservationists annually. As many as 20,000 people visited the farm every year. Sunday tours alone attracted 100 to 200 people. The farm spread over 1000 acres of land. At one point, 200 acres were set aside for apple trees, but they ended up costing Bromfield money. So he got out of apple production. He also stopped his egg production, as well as his sheep and hog breeding. He chose to focus on beef and dairy. Additionally, Bromfield developed a technique known as conservation farming. This was based on grass farming, which produced large quantities of forage and pasture. Malabar Farm became a national model for sustainable agriculture. In addition to this, Bromfield experimented with composting using manure from livestock on the farm. Square fields were changed to follow the lie of the land so as to discourage erosion. 140 acres were put aside for timber. In 1958, Bromfield's children sold the farm to a conservation foundation—Friends of the Land. In August 1972, the deed of Malabar Farm was accepted by the state of Ohio after the Louis Bromfield Malabar Farm Foundation—which had been operating the farm—faced foreclosure. In 1976, the farm became a state park. On April 4, 1993 a fire destroyed the main barn. In September, 1994, 150 volunteers from the Timber Framers Guild of North America raised a new barn in resemblance of the original. Malabar Farm Inn is a historic Stagecoach Inn built in 1820. Today, the two-story brick building has been restored as a restaurant, offering fine French cuisine and home-cooked dining. Just to the east of the restaurant lies Malabar Spring. Seasonally, visitors can purchase fresh, local produce which is cooled by flowing spring water. Louis Bromfield designed the spring-cooled roadside stand himself in 1946. This authentic, rustic log-cabin style home was built in the 1940s by Bromfield's neighbor, Jim Pugh. The cabin was used to film a few of the opening scenes in the 1994 film The Shawshank Redemption. The miller's house, mentioned in the Pleasant Valley collection of ghost stories, was the 19th Century home of a young, mentally challenged girl named Ceely Rose. In 1896, Ceely Rose murdered her three-person family by poisoning their food with arsenic. Annually in October, the Ceely Rose Play is performed in the park's timber frame barn, as part of a ghost story trilogy. The other two plays are Phoebe Wise and Louie. In 2014, an episode of Ghost Hunters was filmed at the Ceely Rose House. The episode, entitled Family Plot, aired on the SyFy channel. The Ghost Hunter's crew investigates claims of paranormal activities stemming from the 1896 triple murder. On this same episode, they also spend time inside Louis Bromfield's "Big House" at Malabar Farm, again trying to document reported paranormal activity. A festival dedicated to early Ohio's winter tradition of making maple syrup. This festival takes place the first two weekends in March. During the sugaring off days, at the farm, learn about the process of harvesting sap from trees, boiling the liquid down to syrup, making candies, sugar, and other sweet treats. There are many activities and demonstrations available with free admission. One of the state's largest outdoor craft shows. The festival includes various living history reenactments, including of the civil war era and buck-skinners. The Main Dairy Barn and Petting Farm. Hostelling International USA operates a 19-bed youth hostel in the farmhouse. ^ a b c Carter, John T. Louis Bromfield and the Malabar Farm Experience. Amereon: Mattituck, NY. 1995. ^ a b c Malabar Farm: The Dream of Louis Bromfield. ODNR Video Production. 1995. Wikimedia Commons has media related to Malabar Farm State Park. This page was last edited on 24 October 2018, at 00:12 (UTC).